Dagenham & Redbridge goalkeeper Tony Roberts recently played his 200th game for the club and has his sights set on more notable landmarks this season. Roberts has been one of the Conference's outstanding goalkeepers since injury forced him to end his League career six-and-a-half years ago. 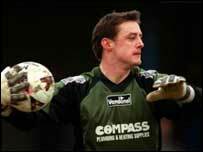 After playing over 150 games in a dozen years with QPR, Roberts' attempted comeback at Millwall was shattered by a second serious knuckle injury. But since regaining fitness and playing with a specially made splint in his glove, the 35-year-old has rarely missed a game for the Daggers and is eyeing another promotion challenge. "I haven't had any problems with it and maybe I panicked a bit at the time, but I have enjoyed myself at Dagenham," said Roberts, who accepted an insurance pay-out and 'retired' when injured for the second time in November 1998. He told BBC Sport: "It's been a really good time here. I have been here five years and in my first season we were third, then second and then lost in the play-off final. "Last season was not so good with Gary (Hill) leaving and this year we are trying to re-build under John Still with a lot of young players. "They are doing well and hopefully we will be better next year, but looking at the table we are in 11th-place but only five points behind second. "That's how close it is. It's certainly the tightest since I've been in the Conference. We have got 11 games left and we've got some big games to play. "If we can pick up points in those and stay up there you never know. A couple of years ago we finished fifth and got into the play-off final." With fixtures to come against Exeter, Stevenage, Crawley, Woking, Morecambe and Barnet, Dagenham have the chance to claw back ground on sides above them. However, if they were to mount a successful late charge and sneak into the Football League for the first time, Roberts would have to 'talk to the insurance company' to see whether he could play in League Two. It is a scenario he is not thinking about too much for now, but whatever happens the Wales international plans to carry on for a while yet. "I want to play for as long as I can. I still love the game," said Roberts, who combines his playing duties with a coaching job at Loftus Road and running his own coaching clinics. 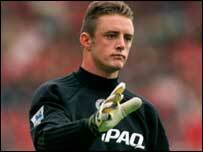 "I am fortunate that coaching the keepers at QPR means I am training every day with them and keeping fit. "I'm training with Championship players, strikers like Paul Furlong, which keeps me sharp and helps me in the Conference. "I will be 36 in the summer but I think I can only get better. People like Dave Beasant and Neville Southall were playing well into their thirties." And Roberts also has the incentive of international football to keep him going after twice helping Wales to win the non-league 'Home International' series. The first person to be capped by Wales from youth right through to full international and then semi-professional level, Roberts was a proud man when he captained the non-league team to complete the set. "I have been fortunate that I have played in the (Four Nations) tournament twice and won it twice. "Hopefully I will be included for this summer's tournament in Ireland. You can't beat the adrenalin from putting that dragon on your chest," he said.